I've noticed something about troubles. When Jimmy first "fell off the swing" and he was lying in a coma, his house was filled with ham and scalloped potatoes. There were Empire cookies and date squares. Cold roast beef and coleslaw. There was so much good that it spilled over into our side of the semi-detached house, because my mom has a refrigerator that my grandfather bought before he died. Aunt Jean is still using an old-fashioned icebox and it's not that easy to get ice anymore. The food lasted for two weeks. I mean, the delivery of the food, and then it stopped. Just like that. It didn't dwindle down to one canasta lady bringing one thing, and another coming forward a few days later. I mean, it just stalled out at the two-week mark, like two weeks was sufficient time for us to get used to the new Jimmy. Carolyn has more experience with troubles than any young girl deserves. 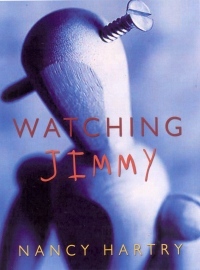 Given the single-parent status of both her household and her next-door neighbor's, she is used to keeping an eye on her friend Jimmy when creepy 'Uncle' Ted is around. On the summer days in 1958 when all of the kids in the neighborhood swarm on Ted's beautiful new Thunderbird, it is Jimmy and Carolyn who are left to polish off all of the fingerprints and Jimmy who gets repeatedly punched in the shoulder, giving him a bruise that gets progressively darker because Uncle Ted "doesn't know his own strength." Yet on the day at the end of the summer when Ted is overcome with anger and drives off with Jimmy, Carolyn follows them. She is the only witness to the violent act, presented to everyone else as an "accident," that leaves Jimmy brain-damaged. Carolyn's life changes after this as Ted becomes more abusive to her and money troubles multiply for the adults in her life. Historical details are filled in through Carolyn's being required to do a speech on why she is proud to be a Canadian for Remembrance Day, an appearance by Tommy Douglas and the appointment of her aunt as the Silver Cross Mother, all of which fit together neatly and wrap up the story. Carolyn is a plucky character who stands up for the right things, including Jimmy, her aunt and remembering that "a helping hand [is] more powerful than a clenched fist." It is a valuable example of a book where a character tells the truth about abuse to the adults around her. The book is recommended as a resource for both public and school libraries as it offers many topics for discussion. Betsy Fraser is a Community Outreach librarian with Calgary Public Library and the author of Reality Rules: A Guide to Teen Nonfiction Reading Interests.